In 2016, the U.S. Department of Veterans Affairs (VA) completed a comprehensive study on the state of military Veteran suicide across the country. In this study, the researchers found that an average of 20 Veterans die by suicide each day, roughly twice the rate of civilian suicides nationwide 1. Although the VA acknowledged that there are several gaps in their research, this is still considered to be one of the most comprehensive studies on military Veteran suicide to date. One of the key findings in this report is that of the 20 Veterans that die by suicide each day, 14 do not utilize Veterans Health Administration (VHA) care for various reasons 1. This means that 70 percent of the veteran deaths by suicide (See Figure 1 below) are by individuals who likely rely on civilian community healthcare providers who may not be well versed in military culturally competent suicide prevention messaging and communication. The National Action Alliance for Suicide Prevention supports the idea that communications can be a powerful tool to promote resiliency, encourage help-seeking behaviors, publicize prevention successes, and encourage actions that help prevent suicide; however, public and interpersonal communication must follow guidelines in order to be effective to reduce suicide among military Veterans and the public at large. To support more effective suicide prevention communication, the Action Alliance developed a Framework for Successful Messaging, which includes four core components for safe and effective messaging about suicide prevention. 2 The components include safe messaging, positive narratives, and adherence to evidence-based guidelines all centered on a core messaging strategy. Strategy – Messages to the public or a specific population across any medium should be part of a well-thought-out strategic marketing campaign. It is good practice to understand the “why” and “who” of the message before deciding on the “what”, “where”, “when,” and “how”. Since target audiences respond differently to varied media and messages, it is best to understand the target receiver of the suicide prevention message before distributing or posting materials. An example that the Action Alliance provides is that using adjectives like “successful” suicide, “unsuccessful” suicide,” and “failed attempt” inappropriately define a suicide death as a success and a nonfatal attempt as a failure, this terminology could do more harm than good. Positive Narrative – the key idea in crafting a positive narrative is to convey a message that help is available, programs do exist to support suicide prevention, and that there are actions that people can take now to help prevent suicide. On their website, the Action Alliance provides a great side-by-side comparison for effective vs. less effective suicide prevention messaging. Guidelines – Understanding that messages can be interpreted in different ways based on the delivery of the sender, the medium used for the message, and the culture of the receiver, the Action Alliance has helped to collect guidelines for development of suicide prevention messaging. These guidelines help to tailor messaging after determining the audience and medium. As we continue to work with stakeholders at the state, county and community level, discussion about suicide and suicide prevention will arise. Applying practical tools for effective communication (such as this two-page guide for speaking publicly about suicide) will help to ensure that we are consistently driving toward a resolution and not contributing to the problem. Suicide Among Veterans and Other Americans 2001–2014. 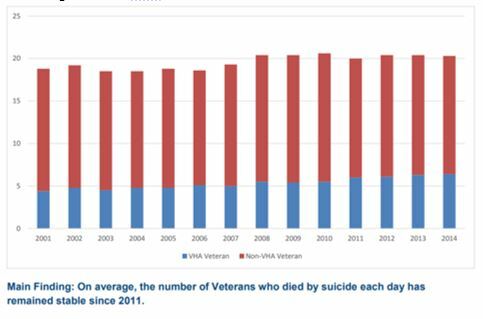 Office of Suicide Prevention, Department of Veterans Affairs, 2016, Suicide Among Veterans and Other Americans 2001–2014, www.mentalhealth.va.gov/docs/2016suicidedatareport.pdf.